Finally I had a chance to take a pic of a finished Pavlova in daylight, and am happy to share the recipe of one of my favorite summer desserts. Since my Pavlova post a couple of weeks ago, I have learnt a lot of new things about it, most importantly (thanks to Faux Fuchsia), that it is Australia's national pudding. Another friend has mailed me a fun article called 'Pavlova Palaver', which goes into depth into the dispute whether the dessert is of Australian or NZ origin. The point everyone agrees on, is that it's named after the russian dancer Anna Pavlova, who visited Australia and New Zealand in the 1920s. When staying at the Esplanade hotel in Perth, the kitchen chef served her a meringue, topped with cream and fresh fruit, and called it Pavlova in her honour. 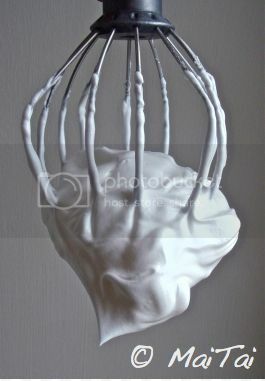 Whisk the egg whites and the pinch of salt on high speed until stiff peaks form. Continue to whisk, while slowly adding the sugar. Then add the corn starch and vinegar, and whisk until all is combined. 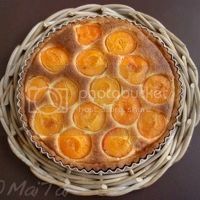 start flattening it with the help of a palette knife..
Place in preheated oven (140 degrees Celsius) and immediately turn the temperature down to 100. 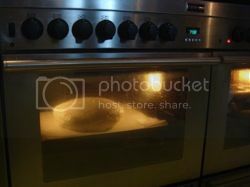 Bake for two hours (don't open the oven door in the meantime) then switch the oven off, and let the meringue cool off inside. 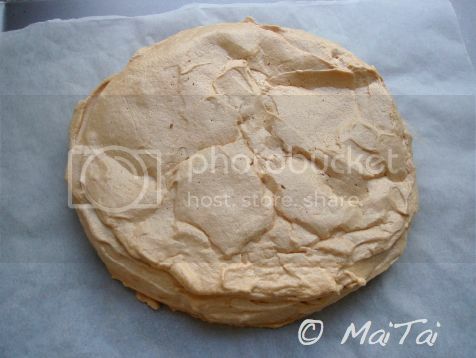 This is how the baked meringue looks like..
Next, whisk 350 ml cream until stiff, and add sugar to the desired sweetness. 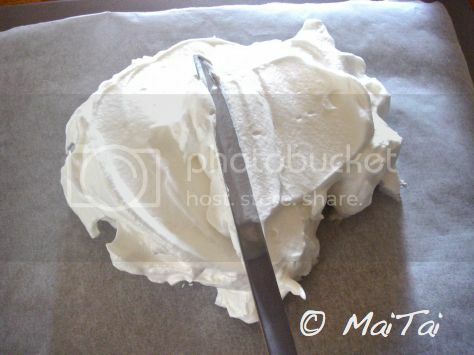 Place cream on top of the meringue. Top with fresh summer berries, and sift icing sugar on top. To adapt the recipe for different numbers of people, count one egg white and 40 gram sugar per person. 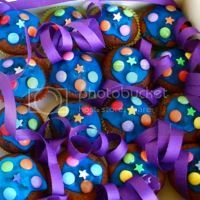 If you like a sweeter taste, you could increase the sugar to 50-60 gram per person, as some recipes suggest. Proportion the cornstarch and white wine vinegar accordingly. No need to measure though, just add or take away a little bit. For the success of the meringue, make sure the whisking bowl and whisker have no traces of grease, and the egg whites no traces of egg yolk. To avoid discarding the egg yolks, I used one of them to make a pastry case, and the rest for a batch of muffins, replacing two of the whole eggs with three yolks. For recipes, click the thumbnails below. 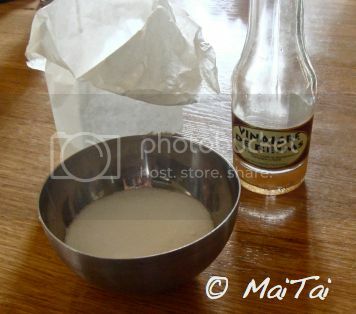 In very hot weather, place the mixing bowl, whisker and the cream half an hour prior to whisking into your freezer. It helps to get the cream stiff. Thanks for the recipe. I can't wait to try this. It's such a pretty dessert with an interesting name and history. WOW!!! CONGRATULATIONS MaiTai this looks scrumptious!! wish I was invited round to sample(my sweet tooth makes me a good judge of sweets !!!) A triumph ! and so so appetising,well done !! Amou. Of course you are invited, dear Amou! I'll make an extra large one, so all the other girls can join too.. it's going to be quite a party! Now thats GENEROUS !! I will bring suitable beverage for all and a sneaky doggy bag for any left overs ! !AS IF !!! A suitable beverage, now that IS generous, dear Amou. Pink champagne comes into mind... hehe! Doggie bags will remain empty though, so far there never have been any leftovers, lol! 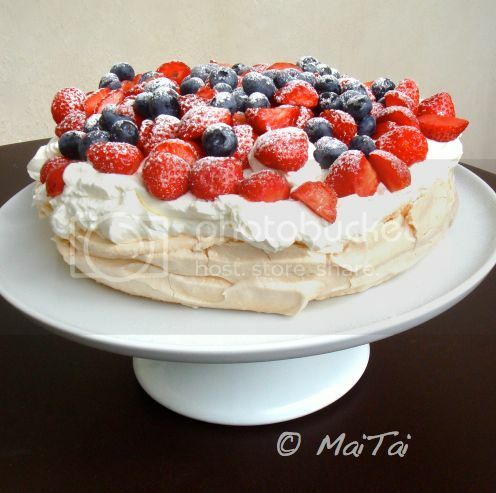 Pavlova is a wonderful summer dessert! Another Australian topping would be passionfruit which is wonderful because the tartness of the fruit cuts through the sweetness of the pav and the richness of the cream. I quite often top it with bananas, strawberries and passionfruit which is a great mix, but if you have access to all those fabulous berries then that's wonderful! 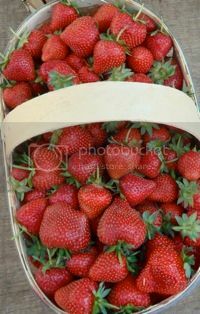 Berries are so seasonal it's great to take advantage of them when they are around and I love how they have beautiful berries in baskets in France. So pretty! Champagne would be a wonderful complementary beverage - you could also try a sparkling pink moscato! My dearest MaiTai, Thank you for this amazing culinary delight! Your vivid photos capture it all - I can almost smell and taste your heavenly creation with my eyes. 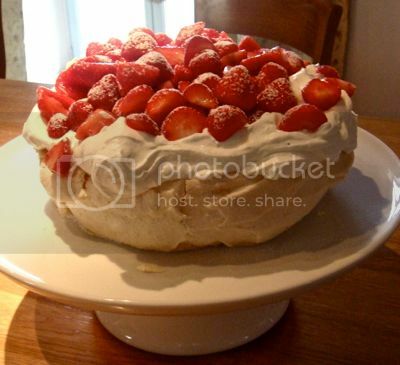 Looks like a magnificent pav (as we call them here in Australia). I am from Perth and we definitely claim the honour of inventing this dessert. C'est magnifique! 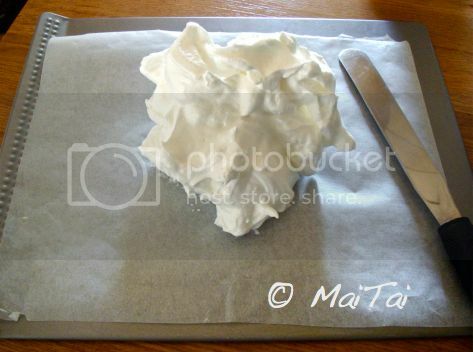 Oh MaiTai, the Pavlova looks amazing. Thank you for sharing your recipe. 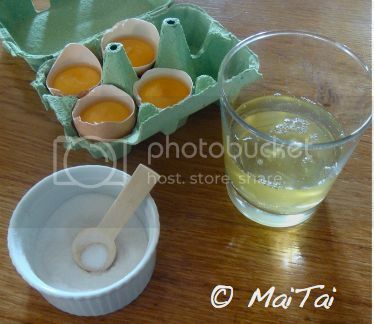 The pictures, especially the one of how to shape the egg whites, were very helpful.... Have a wonderful week!! 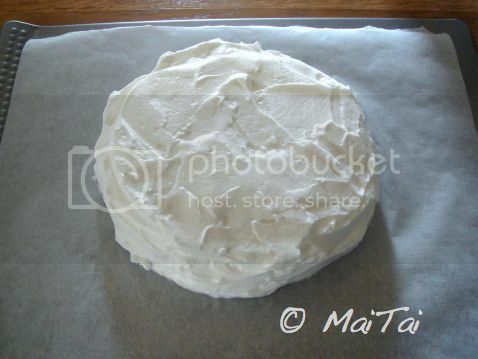 I haven't made a Pavlova in, I bet, about five years, but after seeing this one, I'm going to pull out the recipe again and wait for a relatively dry day in Atlanta in hopes of a non-sticky meringue! This is just gorgeous. I used to make individual ones too, but this is far more spectacular. I doubt your guests realize how lucky they are! I also really enjoyed the seaside dinner pictures. And you look radiant in your florals - as usual! What a glorious picture you have painted, dear Trudye, hugs! Haha dear Blighty, only you can make disasters sound funny!! I hope this time no icebergs! Hi Julie, so great to have a comment from the official Pavlova home town!! Merci!!! One of the great thing about the Pavlova is, that you don’t really need to know how to bake, it is more of an 'assembly job', my dear hair-mess! Even if the result turns out 'so so', you can still throw it all together into a bowl, and call it ‘Eton mess’, a pudding served in England’s famous boarding school. I know I'm late to chime in but I was away for a few days...I wanted to thank you for sharing your recipe for the pavlova. It looks scrumptious and mouth watering. Now we need a nice glass of champagne to go with this wonderful dessert.